It was the way Benjamin Urdapilleta looked over at the ref that gave away his guilt. Benjamin landed his studs on Andrew Conway, and betrayed the look of a man checking to see if clear juices would run free from under the turkey's oxter. Conway was put off his ball-gathering on the Castres line in much the same way that periwinkle pickers are distracted by the incoming tide. Conway knocked on but nobody noticed the incident. Not Wayne Barnes, nor the two touch judges, the video referee, or even the Munster players. There should have been a yellow card, and a penalty on the Castres line, or maybe even a penalty try. Munster did get a penalty for a late tackle on Peter O'Mahony. Joey Carbery missed the tough kick, narrowly. There is no doubt that Joey would have scored from 22 metres out. Munster lost by a single point. There is no doubt either that if I was refereeing Munster would have won. Last week in Thomond, Castres brought the sick bags from the plane. The French were belligerent and nasty on home ground. Still though, Munster had plenty of chances to win. One of Carbery's penalties was perfectly struck only to be knocked off course by a rogue gust from the reindeer pastures of the far north. Carbery was hit very hard early on and he must have been carrying the remnants of an injury from last week. He's learning on the job and when he graduates it will be with first-class honours. Jonathan Sexton was well in to his twenties before he became the finished article. We were soaked twice in San Sebastian. It rained for two days in Montpellier for a semi. You wouldn't put Shane Ross out in the weather for the Champions Cup Final in Bilbao, when the Tipperary people were dancing four-hand reels around the May Pole in Mullinahone. The sequel to 'Angela's Ashes' will be shot in St Tropez. But there's no point in blaming the foul weather, the foul play or the four referees. Five of our forwards gave away chance-their-arm penalties. Castres are the champions of France and they tried their damnedest. The bonus point was won though and Munster still own their own destiny. The team stayed loyal to the Munster ethos of honesty and bravery. Jean Kleyn has been in Munster now for more than four years. He signed a new contract a couple of weeks ago. There is no doubt that Kleyn could have made more money if he moved to France but he stayed loyal to the Munster he loves and now calls home. CJ was offered even more but he is in all-in, not a blow-in. Neil Francis was right to start the debate as to the number of players in the Munster 23 who were not born in the province. There's an enclave in the south side of Dublin that produces more internationals than anywhere else in the world. Nearly every school in Munster plays hurling or football. The south Dublin schools have massive financial resources and their players are oven-ready for academy rugby. These schools are the envy of the rugby-playing world. It's also as simple as Dublin is where most people live. There are no Senior Cup teams in Kerry, Clare or Waterford. There are two in Tipperary. Munster needs new blood. 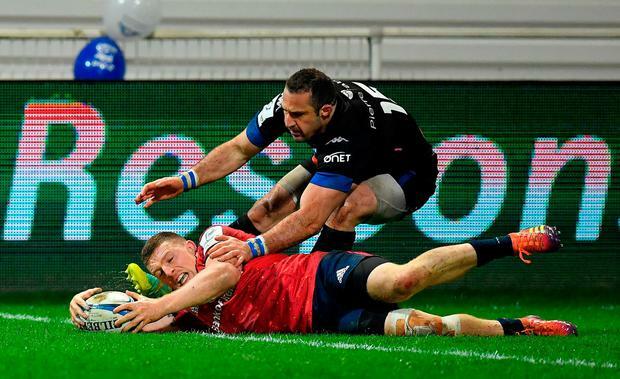 Nine Munster-born played against Castres. You wear the shirt worn by Foley and you are Foley, wherever you come from, otherwise just close the door on the way out. The David Nucifora and Joe Schmidt relocation has worked for Ireland. One of the main reasons Kerry have won so many All-Irelands is that the county team always comes first. This land, this province, this jersey is not to be kept for the few. The chance to become Munster is there for anyone who is worthy and willing to commit their future to our cause and to our ways. The question of integration goes well beyond rugby. On 26 November last, 3,000 new citizens swore allegiance to Ireland in Killarney. There were tears from the joy of belonging. These Irish are us now and always will be. Retired Judge Bryan MacMahon officiated at the citizenship ceremony. Here's what my neighbour said: "We are a nation of emigrants. We understand emigration and, now more than ever, we have sons and daughters who have had to emigrate and who live abroad but with your help we will rebuild our economy and welcome them back." Who then is more Irish or more Munster than any other among us? Munster is as Munster does. Independent.ie Newsdesk Three Leinster players have been included on the five-man shortlist for EPCR European Player of the Year.